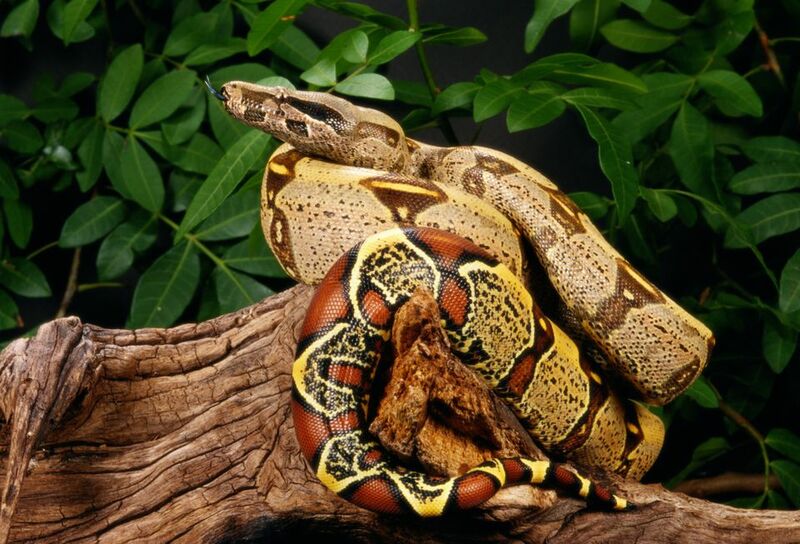 The red tailed boa, also referred to as a boa constrictor, is a very common choices as a pet snake. Red tailed boas can be easily acquired from a breeder, pet store, or reptile show and are identifiable by their red patterned coloration on the end of their tail. Red tail boas are native to Brazil and nearby areas where they spend their time in rain forests and lowlands and while their environments vary they are considered moderately arboreal. The red tail boa grows to be 8 to 10 feet in length and can weigh about 50 pounds when it is full grown. They will live 25 to 30 years in captivity if well cared for and are big snakes for the average pet owner. Red tailed boas need to be seriously considered before being purchased due to their strength, size, the amount they eat, and their ability to constrict. They are not legal to own everywhere so be sure to check your local laws as well. The reason red tail boas are so popular is due in part to their typically docile temperament. They aren't usually aggressive snakes but even if they aren't upset they can do damage to a person quite easily by constricting (to hang on to someone's hand, neck, or arm) or biting you if they think your hand is food. A 10-foot snake needs a little room to move about but they don't typically like stretching to their full lenght. Snakes feel more secure when they are hiding under something and are able to curl up. If they are fully uncoiled, it's usually a sign they feel vulnerable and threatened. An enclosure that provides 8 to 10 feet of floor space, is a couple of feet high and a couple of feet wide is plenty big for an adult red tailed boa. Perhaps the most important thing about an enclosure for a red tailed boa is how secure it needs to be. All snakes are escape artists and will push through unlocked lids and squeeze through small openings. All snake enclosures should have locks or latches to prevent an escape, which can be dangerous to both the snake and people living in the house. Placing a red tailed boa inside a tied pillow case works well for transporting or to temporarily hold them while cleaning their enclosure. Since red tail boas come from a tropical environment, the ease of maintaining humidity levels should be taken into consideration when setting up a cage. Glass or plexiglass sides and lids help to keep humidity higher in an enclosure but you will want to make sure enough air is still able to circulate inside and that nothing will melt from the heating devices. Your snake needs a large, sturdy bowl for water. It should be able to easily fit its entire body in the bowl to soak. Red tailed boas should also have a hide box or place to escape the heat and to curl up in a quiet, hidden place whenever they want to. Many owners use wooden or cardboard boxes for hides and replace or clean them as needed. Tree branches may or may not be used by your snake. The kind of bedding you choose should be easy to clean since a large snake produces quite a large amount of waste material. Paper towels are great for young red tail boas and reptile cage carpet or indoor/outdoor carpet cut into removable sections are easy to clean when you have an adult snake. Other materials that are often used include reptile bark, reptile dirt mixtures, and other natural floor coverings. Sand is not appropriate for red tailed boas; they may ingest it causing a digestive impaction. Since red tailed boas are from Brazil they like their environments warm. A basking spot of 90 to 95 degrees should be maintained using heat lights or other means. But avoid using hot rocks because they can cause thermal burns in a snake. The rest of the tank can be in the upper 80 degrees and at night it's safe if the temperature drops into the lower 80's. Heat lights, ceramic heat emitters, undertank heaters, and incubator cages are all acceptable means of heating a snake cage. Just make sure your snake cannot get to the heating element and burn itself. UVB lighting is not mandatory for red tail boas, but if you want to offer supplemental white light during the day, a UVB light is a great option. It may even help stimulate appetite, decrease stress and make your snake an overall happier, more active snake. Juvenile red tail boas will eat fuzzies, then mice, then rats, and once they reach adulthood, will be eating rabbits and large rats. Prey items should be killed prior to feeding them to your snake and offered in an enclosure used only for feeding. Do not feed your snake in its regular cage; this will decrease the likelihood of the snake thinking you are food and accidentally biting you or ingesting its substrate. The feeding tank should be covered with a towel while feeding to provide a sense of security to your snake, or you can place your snake's hide box in the feeding tank while feeding. The most serious disease that can affect boa constrictors is inclusion body disease, or IBD. This is a fatal retrovirus, akin to HIV in humans. This virus can lay dormant for years before the snake shows any sign of illness. This disease can be transmitted from snake to snake via mites, which carry infected bodily fluids. This is why it's a good idea to keep mutiple pet snakes separated if possible. IBD is marked by poor appetite and excessive saliva, and in serious or more advanced cases, IBD causes snakes to lose control of their bodily movements. Red tailed boas also are susceptible to respiratory infections, marked by wheezing and nasal discharge. A foamy discharge from a snake's mouth usually indicates pneumonia, which requires immediate treatment. Scale rot and blister disease are both common in boa constrictors, with both usually caused by unsanitary conditions. Blister disease may appear like burns on the snake's skin and is usually caused by overheated cages or a lack of humidity. All of these ailments should receive treatment from a veterinarian who specializes in reptiles. Red tailed boas are large, strong, long-lived snakes and aren't for everyone. Feeding them can become more expensive as they get larger, and so will the time it takes to clean their cage. Therefore, make sure you are prepared and know what to expect before taking home any pet, especially one that lives up to 30 years. You also may want to check out all of our other snake breed profiles.